It’s springtime in Milwaukee and that means three things – beer, brats and Brewer baseball! I took my two kids to the Brewers fourth home game of the year last week. Thank goodness for the retractable Miller Park roof. The weather outside was 45 degrees and overcast but a comfortable 68 degrees in the “dome”. 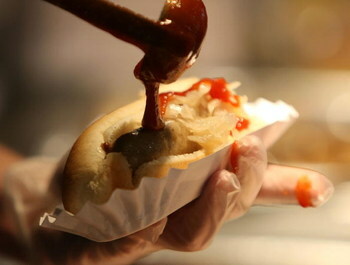 Biting into my first Miller Park brat smothered with the famous secret sauce of the new baseball season reminded me of a story in a recent book I read. I was introduced to Milwaukee resident and businessman Joe Sweeney at a business breakfast function this past January. 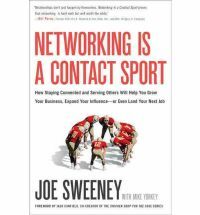 I was intrigued by his presentation and purchased a copy of his book, Networking is a Contact Sport. Sweeney shares his networking secrets from a long and successful career as a business owner, sports agent and investment banking consultant. His big secret: master networkers are focused on Giving, not Getting. With today’s difficult economy and uncertain workplace, networking has never been more important. The cliché that who you know is more important that what you know has never been truer. Sweeney, in typical Irish story telling fashion, illustrates his insights with dozens of helpful examples from is own life along with a few fascinating insider sports stories. Now back to the brat based story I mentioned earlier. It was May of 1995 and Joe Sweeney, as President of the Wisconsin Sports Authority, was charged with the task of finding a prominent national figure to emcee the Wisconsin Sports Hall of Fame induction ceremony slated for November in Milwaukee. The board of directors to the Hall of Fame came up with the decision to try to land Bob Costas. Sweeney, through his network connections with a local sportswriter found that Costas worked out of an office in St. Louis. He called the office and reached Mr. Costas’ assistant Pam. He explained to Pam that he was representing The Wisconsin Sports Hall of Fame dinner that was to take place in November and included a gala event with a stellar induction class including Al McGuire, Robin Yount and Bonnie Blair and would love to have Bob emcee. Before he could continue Pam mentioned that Mr. Costas is way too busy but appreciated their interest. Now for some people, that would have been the end of trying to get Costas…for Sweeney it was just the beginning. A short time later that same month, Joe went to a Brewer game with a business associate. After Sweeney’s friend downed his third brat before the second inning, it occurred to him that Costas was always raving about the Milwaukee County Stadium brats whenever he broadcasted a game in Milwaukee. Through a networked friend, he contacted Sportservice, the outfit that ran the concessions at County Stadium. The next day he had a box of brats packed in dry ice shipped to Bob Costas’ office in St. Louis along with a nice cover letter. Two weeks later, after hearing nothing from Costas, Sweeney has Sportservice send him a case of the secret stadium sauce. In June, after meeting with the governor of Wisconsin, Tommy Thompson, Sweeney asked if he could write a letter to Costas on official letterhead declaring that his presence would add “a touch of class” to an evening that the entire Wisconsin sports community had been looking forward to for months. Every two weeks, Sweeney followed up with phone calls to his new best friend- Bob Costas’ secretary named Pam. He spaced the inquiries out so as not to appear obtrusive, but they were regular enough to send the message that they still hoped Bob Costas would find the time to grace the Wisconsin Sports Hall of Fame event with his wit and charm. Do your research. Sweeney had to use his network connections to find out that Costas had an office in St. Louis. He also remembered how much of a raving fan Costas was with the County Stadium brats smothered in secret sauce. There’s no substitute for the personal touch. Every attempt to engage Bob Costas was done through a personal phone call or a direct letter and package from Sweeney. This was before the days of iPhones and Blackberries! He didn’t give up! The first no was only the start to Costas saying yes in Sweeney’s eyes. The story got me thinking about the different items we have sent prospects over the years. The list includes Hula-hoops, hammers, Racine kringle, electrical switch boxes and fake $1,000,000 bills! What have you sent to make yourself stand out from the crowd and not get caught up in the sausage race? I always enjoy reading your articles. You always bring out the best in a story.